Patient adherence to medication regimes is a large problem across the world. Across all medicines, it has been estimated that up to 75% of people do not take their medicines properly. This could be a problem in epilepsy as a lowering of the medication in the bloodstream could lead to breakthrough seizures. We wanted to know how often people who receive our e-newsletter felt that they adhered to their medication regimes. The results were interesting. Please bear in mind that this was a self-selecting poll of 125 people and so any results must be read in that way. They were also asked to estimate for themselves how many times in the last month that they had forgotten to take their medication altogether or had taken it at a different time to that which had been recommended. Of the 125 respondents, almost 90% were responsible for their own epilepsy medication while just 9% were responsible for someone else’s medicine (as a carer or parent). 90% of the respondents had to take their medications two or more times a day with the majority having to take medication twice a day. Half of our respondents were taking just one medication while 28% took two medications. Almost a quarter of our respondents are taking 3, 4 or more medications for their epilepsy each day. 52% said they had not forgotten to take their medication or give someone medication at all. Just over 20% said they had forgotten once in the last month. 25% said they had forgotten twice or more in the last month. 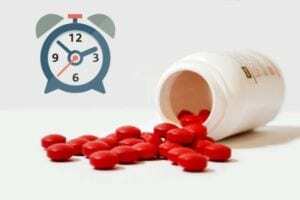 54% said they had not forgotten to take their medicine at the right time in the past month. 15% said they had taken their medicine at the wrong time once in the last month. Over a quarter said they had taken their medicine at the wrong time twice or more in the last month. Here are some simple tips to help you remember to take your medicine.